Avoiding 3-pile wins -- is that a thing? I recently played a game against someone who deserved to win and could have won with a 3-pile ending, but refused to take it. I won the next turn. I was stunned. This was not merely a case of not seeing the 3-pile. I asked about it in chat, and they suggested that they don't do 3-pile endings. Is that a thing? Is there some subset of players who consider that a lesser victory? Re: Avoiding 3-pile wins -- is that a thing? If players really do hate 3-pile endings, they'll blacklist you after the game, and you can blacklist them. Take the win. That is such a weird way to play, especially given that for some kingdoms (e.g. Beggar-Gardens) it would be incredibly painful to try to empty the Provinces with such rubbish decks. Can this be a coincidence...? 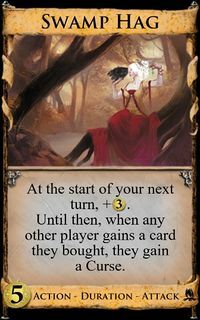 If there were an attack card that gave someone a curse every time they bought something during their turn, I would be satisfied. ... or did he leave after finally being satisfied that there was a way to properly defend against premature three-piling? But then there's the horrible realisation that Swamp Hag also helps you 3-pile. He probably left after realizing that he was still banned. Off topic: Can you see who has blacklisted you?